1928, New York. 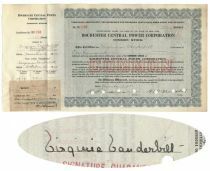 Stock certificate for 100 shares in the Rochester Central Power Corporation. Blue/Black. Issued to and signed on verso by VIRGINIA VANDERBILT wife of William K. Vanderbilt, Jr. Punch cancellations not affecting bold signature. Very Fine.